Discover Hiking & Trekking Tours in Gorakshep Trail in April 2019, visiting places like Lukla and Namche Bazar. Book now and save with TourRadar.com! "This tour is probably going to be one of the most memorable experiences of my life...."
"Our last trek in Nepal with NepalHiking was in October 2017 for Annapurna Base camp...."
"I am very much satisfied with this Everest View trek as it met my all the expectations..."
"If you want to experience the majestic and surreal Himalayas in Nepal, I would recommend..."
"Firstly, i would like to thanks Ganga & Balaram as they had been amazing for replying..."
" I would like to express my gratitude towards Nepal Hiking Team for providing me..."
"A trip of a lifetime and a dream come true for me. Fabulous organization by Debra..."
"The trek was amazing,exciting.i had a 12 days trekking with my family me my dad and..."
"My wife and I had an unbelievable experience trekking 12 days to Everest Base Camp..."
"I arrived in Kathmandu and was thoroughly taken care of by the tour operator Bhagwat..."
"It was an amazing experience...I AM VERY HAPPY WITH OUR GUIDE... 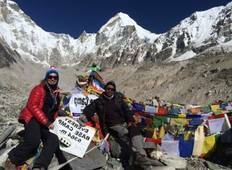 VERY COOPERATIVE..."
"We are a group of 6 chose to trek Everest Base camp Trek in early September after..."